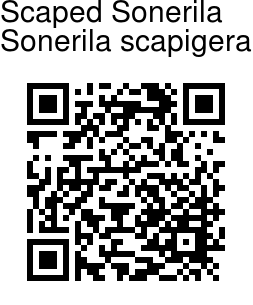 Scaped Sonerila is a small annual herb growing up to 10-15 cm tall. The plant has no stem. Oppositely arranged leaves arise directly from the root. The purple tinged leaves are ovate, minutely serrated, with a heart-shaped base. 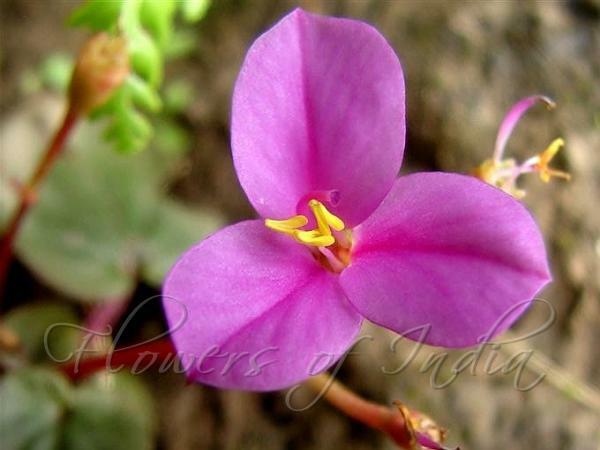 Many rosy purple flowers appear on an erect leafless scape, 3-7 cm high. The flowers have three inverted-egg-shaped petals with pointed tips. Flowers have 3 stamens with bright yellow anthers. This herb is occasionally found on wet rocks in the Western Ghats. Flowering: August.